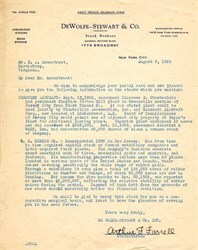 Historic investment letter from DeWolfe-Stewart & Co dated in 1929. This item has the signatures of the Company's Statistician and is over 79 years old. The letter mentions Crescent Aircraft and U. S. Rubber Co.